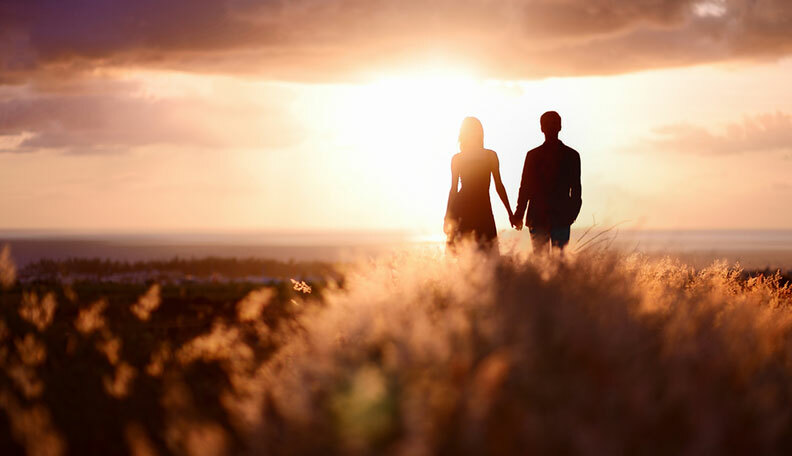 For most people, the top priority in life is finding a romantic partner or improving the one that they have. Let’s look at why this quest seems to consume us. In the Way of Mastery, Jeshua says “you think you fall in love.” What is this process of falling in love? Do we choose who we fall in love with, or is that person part of our divine lesson plan? Many of a us think that a relationship can heal us by giving us the loving connection we need to heal our wounds. Your parents failed you when you were growing up, but an adult relationship will make up for all the past hurt. You have a hole in your heart that only romantic love can fill. And we have been taught this over and over. We have been bombarded with the message that you are not complete without a partner and that a successful romantic life is the only one worth living. But we are being set up to put the focus in the wrong place. It is not that the perfect partner will heal you, but that every experience provides the opportunity for us to heal ourselves. Is it possible for a love partner to help us heal? Yes, it is very possible. Harville Hendricks has shown us how we can work together in a committed partnership to heal our childhood wounds. Through sharing and understanding each others connections to past traumas and disappointments, we understand our partner better, which helps us release our judgements of them and in the reciprocal process, we receive the love and understanding of our partner. For those lucky enough to have a partner who is willing and able, this is a wonderful thing. But what about those of us who have an uncooperative partner, are we doomed to keep reliving the traumas of the past as we seek out partners who hurt us in just the ways we were hurt as a child? When we are in love, we do not feel we have a choice but to love that person, and because we are in love, everything hurts so much more. If we were not in love in someone who treated us unkindly, we would probably just choose to spend less time, or none at all with that person, but when we are in love it causes us anguish and we still want more than anything to be with them. What a painful position to be in! Yet what if this was a perfect opportunity for healing and self growth? Even with an uncooperative partner, love is our greatest opportunity for healing. Each time a button gets pushed, it it showing us where our old unhealed wounds are. Once our old wounds are healed, our buttons don’t get pushed anymore. Each new wound points out to us an area that needs to be healed, and is an opportunity to practice unconditional love. You can’t grow in your ability to experience unconditional love with a perfectly loving partner, can you? And even if you had one, those old unhealed wounds would get you to create or imagine the hurtful behavior that reactivates them anyway. I was lucky enough to marry a man with whom I was passionately in love and who seemed perfectly designed to push all my buttons. Although I had done a huge amount of healing work on the traumas I had suffered as a child, he was able to bring up so much that was unresolved and needed healing. Living overseas and having no support network to fall back upon I was forced to confront my own demons and come to terms with all the hurt and disappointments. As I worked on forgiveness and unconditional love, I saw how I too failed to be a perfectly loving partner, usually because I felt entitled to be treated with the love and respect that I thought would heal me. And I got to see the scared little girl inside when I was met with hatred, judgment and contempt instead of understanding. Each of us is on our own unique path toward healing and this relationship was my royal road to unconditional love. As I worked on my own to further heal those old wounds, I was able to see how my demands for love and respect were unloving, coming from my smaller self and ultimately were ego. As I practiced forgiveness and unconditional love I saw the part of myself shrinking, losing whatever hold it might have had on me. I wish I could say that this process also transformed my husband, but in this case it did not. The more I was successful, the crueler and more withholding he became, but the miracle was that I was more and more able to maintain the loving and forgiving viewpoint. Which meant that I was extraordinarily happy, and it did not depend on him. I came to see and feel how love is everywhere all around us at all times. And that is where the real transformation happens, when we come to recognize that love is!! Love is in every molecule of air we inhale. Love is in every ray of sunshine and every drop of rain. Every chance encounter with another human being is an opportunity to connect, to smile, to share love. Our heart is our guide to our inner wisdom, and falling in love is the ultimate boot-camp for the soul. So what will you do the next time you fall in love? Become the needy child who demands to be loved in just the way he or she thinks is the correct way? Or take the challenge that love is offering us: to see ourselves more clearly, heal our wounds and transform our capacity to love?